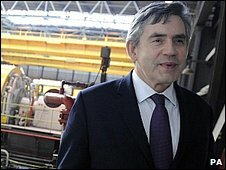 Gordon Brown has criticised "crude" personal attacks in politics as the debate between Labour and the Tories over spending continues to rage. People should "think twice" before making accusations, Mr Brown said, stressing he avoided personal attacks. Tory leader David Cameron says Mr Brown is not being straight with the public about the need for future spending cuts to tackle spiralling debt levels. Earlier, Jack Straw denied Labour was losing authority after recent setbacks. The Tories say the government's apparent U-turn over Royal Mail, a partial climbdown on ID cards and a defeat over part of its bill to "clean up" Parliament shows ministers have lost the ability to govern. With the row over public spending continuing apace, Mr Cameron said the public wanted "political leadership that is clear about the depth of the problems we face". In a speech to council leaders in Yorkshire, he said it was "not leadership to deny that our public finances are in a crisis... not leadership to say that spending on public services is going to rise when it is not". Mr Cameron has previously said he believes there is a "thread of dishonesty" running through No 10. On a tour of the North East, Mr Brown told Channel 4 News that people should "think twice" before making accusations. "I think if someone is called dishonest, there is an assumption that there is some wilful desire to mislead and there is some corruption involved and I don't think that is the case," he said. "There is a crudity developed in the language people use in politics that people are now accepting as almost everyday language, to accuse people of this or that. "I do not make personal attacks on people. I have tried to avoid doing that during my political career." But Lib Dem schools spokesman David Laws told the BBC's Question Time programme that Mr Brown was "patently not" telling the truth about pressures on spending. He said he believed No 10 was in a "state of complete denial" about the issue. Ministers have been defending the government's actions after its decision to shelve plans to sell a minority stake in Royal Mail and the loss of a Commons vote on a clause of their proposed parliamentary "clean-up" programme. Asked on the BBC's World at One programme whether these reverses showed the government was losing authority, Mr Straw said this was not the case. "What we are doing is obviously listening very carefully but also taking account of changed circumstances," he said. MPs rejected by three votes a clause in the government's Parliamentary Standards Bill to allow their proceedings to be used in court against an errant MP, breaking the long standing right to Parliamentary privilege. Among Labour MPs to rebel over the issue were former Home Secretary John Reid and ex-Foreign Secretary Margaret Beckett. The government wants the bill - which was eventually passed by MPs and will now move to the Lords for consideration - to be law by 21 July when Parliament breaks up for its summer recess. Many MPs argue the legislation is being rushed through Parliament, with insufficient opportunity to debate matters of constitutional significance for the workings and sovereignty of Parliament. But Mr Straw said the bill had "substantial support" and believed the legislation would prove effective.